POLITICS ARE HELLKaylin wasn’t sent to the West March to start a war. Her mission to bring back nine Barrani might do just that, though. She traveled with a Dragon, and her presence is perceived as an act of aggression in the extremely hostile world of Barrani-Dragon politics. Internal Barrani politics are no less deadly, and Kaylin has managed—barely—to help the rescued Barrani evade both death and captivity at the hands of the Consort.Before the unplanned “visit” to the West March, Kaylin invited the Consort to dinner. For obvious reasons, Kaylin wants to cancel dinner—forever. But the Consort is going to show up at the front door at the agreed upon time. The fact that she tried to imprison Kaylin’s guests doesn’t matter at all…to her.A private Barrani Hell, built of Shadow and malice, exists beneath the High Halls. It is the High Court’s duty to jail the creature at its heart—even if it means that Barrani victims are locked in the cage with it. The Consort is willing to do almost anything to free the trapped and end their eternal torment. And she needs the help of Kaylin’s houseguests—and Kaylin herself. Failure won’t be death—it’s Hell. And that’s where Kaylin is going. Loved reading this book! I just love this series so much! This book dived into another aspect of Barrani, with the test since the Cohort is taking it! So great, and I enjoyed it so much! Can't wait for the next book! *Need to ReviewNote: There were a few moments when I argued at the book. I know. It's silly. You can't argue with a book but I did. This series is one where I can safely say that I'll wait till the end to see how I feel. Those parts where I argued with the book? I'll probably do it again the next time I read it but it doesn't matter because I finished. The book is what it is because I want to argue with it. When you are fourteen books into a series, obviously, there is something that you like about the series and has kept you reading book after book. I am no exception. I love the overall premise and potential of the story. I like several of the characters. Kaylin, Nightshade, and Mandoran being my top three favorites. I find myself liking Hope and Spike a little bit more after this book, when previously I found the familiar very annoying. I also liked Evarrim, Ynpharion, and Emmerian in this one. T When you are fourteen books into a series, obviously, there is something that you like about the series and has kept you reading book after book. I am no exception. I love the overall premise and potential of the story. I like several of the characters. Kaylin, Nightshade, and Mandoran being my top three favorites. I find myself liking Hope and Spike a little bit more after this book, when previously I found the familiar very annoying. I also liked Evarrim, Ynpharion, and Emmerian in this one. The world building is well done. The overall story continues at a slow build. My biggest gripe with this particular book is that over 60% of it is comprised of discussion and introspection. Okay now, granted, at this point it’s book 14 and I have the grudging expectation that there is going to be a great deal of the main character, Kaylin, navel gazing. This author loves to do it. The first half of the book is largely a long winded discussion rehashing everything, we as readers, have learned from previous books with a light sprinkling of new information. I wanted less telling and more doing. There are also a few technical word errors that need editing. I DID like that Kaylin figures out some things about her abilities as Chosen (and can finally understand other things as well). Yes, thank you! It’s about time. She also has some brief and, almost but not quite, satisfying interaction with Nightshade. I am glad that she doesn’t completely ignore him and there is some minuscule resolve there. I like that Nightshade actually gets a face to face moment with Kaylin, it’s been several books now, and even an interpersonal comment instead of just being a source of information related to the immediate problem at hand. The situation with Severn, well, if you follow the pattern then he’s up next. Quite possibly the best moment in the book is had between Ynpharion and Kaylin. Haha! Have I really given this book four stars? Yes, yes I have and I mean it despite how frustrating it was, how frustrating this entire series is. Never have I had so much information about a fantasy world and its magical system hurled at me and yet been left me feeling so ignorant about how it all actually works. It’s deep and complex and wordy and opaque. Something about true names and runes and sigils, the need to fit them together or something.Kaylin’s character arc is also frustrating. In fourt Have I really given this book four stars? Yes, yes I have and I mean it despite how frustrating it was, how frustrating this entire series is. Never have I had so much information about a fantasy world and its magical system hurled at me and yet been left me feeling so ignorant about how it all actually works. It’s deep and complex and wordy and opaque. Something about true names and runes and sigils, the need to fit them together or something.Kaylin’s character arc is also frustrating. In fourteen books she’s intervened in all the races affairs and been a force for good in all of them. She’s managed somehow to save the world, the entire world, several times and yet she still can’t get a promotion in the Hawks. She still seems to get very little respect and not nearly enough self-respect. She’s constantly underestimating herself and operating by instinct. She doesn’t seem to believe in her own ability to learn what she needs to know to truly get a handle on this Chosen business. If there ever was a “Chosen” in the history of that world that accomplish nearly as much as she did in twice the time I would be amazed. It’s a fictional world, but I’m still given that impression. I’m sick of characters constantly telling her how she’s only mortal and merely has a few decades. Anything can happen in these fantasy worlds so I still hold out hope that one day she’ll shed her mortality and proved to them her true worth. If all those beings around her can be immortal then why can’t she who saved them all multiple times over?I get impatient with it all sometimes. The story moves ahead very slowly and there are so many characters that, even if I went back and started from the beginning of the series and read my way all away though, I’m still not sure I could keep it all straight. A lot of the names are so similar that I mix them up. I don’t know how many times I’ve asked myself “Who was that again?” or digressed just to figure out who was talking to who. I might’ve given up if I cared less about these characters.So there you go. I’m clearly emotionally invested in these books despite how annoying they are at times, maybe because of it. Kaylin and her friends have managed to worm their way into my heart, though it escapes me exactly how they did it. So much about this series seems to defy logical examination. I’m sure there ought to be a destination, somewhere where Kaylin will end up where she can stop beating herself up for always being inadequate, though she never is. Anyway, I can’t tell you why these books are terrific. They just are so Michelle Sagara must be doing something right. This #14 installment of the Cast series delves deeply into Barrani politics, the "lost" children of the green, and the Test of Name that all Barrani Lords must pass. It is in no way the book for a new reader to join the series, as the first couple hundred pages are mostly exposition into the background of various Barrani lines and their relationships with the Consort and the High Lord, which would be very confusing without having read the earlier novels. Action doesn't truly begin to unfold unti This #14 installment of the Cast series delves deeply into Barrani politics, the "lost" children of the green, and the Test of Name that all Barrani Lords must pass. It is in no way the book for a new reader to join the series, as the first couple hundred pages are mostly exposition into the background of various Barrani lines and their relationships with the Consort and the High Lord, which would be very confusing without having read the earlier novels. Action doesn't truly begin to unfold until the Consort comes to dinner and asks Kaylin, Teela, and the cohort to carry out a long-wished-for task. The second half of the novel moves more rapidly, although Kaylin's inner anxieties bog the prose down at times. Still, I always enjoy this character-driven series, and it definitely had some wonderful (and humorous) moments with Ynpharion, Nightshade, and Mandoran's interactions with Kaylin. Looking forward to book #15! Originally published at Reading RealityThings are like other things. The stories we’ve read in the past affect how we view the stories we read in the present. There was a point in Cast in Oblivion where one of the characters describes Ravellon as the spike that is holding all of the parallel worlds together and I had an OMG moment and realized that Ravellon might be Amber. In Roger Zelazny’s incredible epic/urban fantasy series, beginning with Nine Princes in Amber, Amber is the one true world a Originally published at Reading RealityThings are like other things. The stories we’ve read in the past affect how we view the stories we read in the present. There was a point in Cast in Oblivion where one of the characters describes Ravellon as the spike that is holding all of the parallel worlds together and I had an OMG moment and realized that Ravellon might be Amber. In Roger Zelazny’s incredible epic/urban fantasy series, beginning with Nine Princes in Amber, Amber is the one true world and all the other worlds, including ours, are mere shadows of it.Ironically, in Elantra, Shadow seems to come out of Ravellon. But the analogy might still hold. Or hold enough to serve as metaphor. Which is an often raised topic in Cast in Oblivion, as so much of what Kaylin experiences is described as being a metaphor. She doesn’t see the world the way the others in her life – and even in her house – even the house itself – see it. And while her metaphors are frequently frustrating to her companions, and often not strictly true, they usually turn out to be right.For select values of right. Generally right enough to fix whatever has recently gone wrong – even if, or occasionally especially because, Kaylin is at the heart of what went wrong in the first place. At least she often feels like it is. 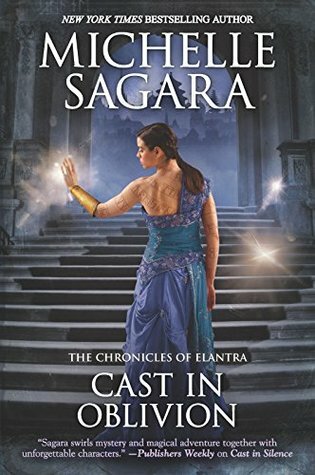 And that idea, like Kaylin’s metaphorical view of her circumstances, may not be strictly true, they are also usually right – or at least point her in the right direction.Sometimes like a knife.The Chronicles of Elantra by this point, 14 books in, is a densely packed epic fantasy. Packed to the point where no reader could possibly start here and have any of it make sense. Because this book in particular feels very insular – in the sense that the events and issues that are at the forefront in Cast in Oblivion have been bubbling along since book 8, Cast in Peril – if not before. In fact, much of the action in every book since Cast in Peril has its roots in the journey that begins in that book.In other words, don’t start here. If any of the above or below sound interesting, start with either the prequel novella, Cast in Moonlight, or the first book in the series, Cast in Shadow.At the beginning of the series, it felt like urban fantasy, albeit urban fantasy set in a high fantasy world. As the series, and Kaylin, have evolved, it has become an epic fantasy, with Kaylin Nera, human, mortal, flawed, young and “Chosen” as the point of view into a world that is run by “people” much more powerful than she. Kaylin is always operating way above her weight class and suffering through impostor syndrome at every turn.She’s awesome, not because she’s powerful, but because she never stops trying – no matter how scared she is or how many of those powerful people either underestimate or overprotect her at every turn.In the end, this is a story about friendship, and the heights and depths that people can and will reach in its name. It’s also a story about family-of-choice and the ties that one chooses to bind oneself with.And it’s about the power of truth and honesty. And especially about the dangerous nature, and painful truth, of the power of choice.Escape Rating A-: I love this series, but you can’t get into it here. And I’ll confess that it takes a while each year to get back into it. The story is like a spider’s web, sticky and interlocked at every turn.It’s also difficult to review. I can say that I love this series, and I do, but that’s not informative. Trying to say why I love this series is awkward. But I’ll try.I do love a highly convoluted political fantasy, and this series has certainly become that. The Barrani, who are this series equivalent of elves (sorta/kinda) are immortal. They hold grudges for millennia. As do their ancestral enemies, the dragons. Who are also immortal. And currently ruling the empire the Barrani are part of.The part of the story that we are in revolves around family politics and a sibling rivalry that has literally gone on for centuries. But even though the Barrani are immortal, it has not made them wise – not in any way.Kaylin is in the position that she is in because one Barrani hoped against all hope that she might be able to save his brother. The brother that he became outcaste for – and that word means exactly what you think it means. And this in a society where people are much more likely to kill their siblings than either love or trust them.This series also has its roots in urban fantasy, complete with the requisite snark – although that snarkitude has become oddly similar to that in both J.D. Robb’s In Death series and Lindsay Buroker’s Emperor’s Edge series. It’s the kind of smirky and sometimes gallows humor that draws its rueful chuckles from how much we have come to know, and care for, these characters. They aren’t telling jokes, they are telling on each other – with honest love, honest regard and occasionally an honest desire to put one over on their friends and frenemies.But in the end what draws me back to this series is the character at its heart, Kaylin Nera. She began the series in Cast in Moonlight attempting to commit a really grand suicide by cop, only to find herself adopted instead of imprisoned.She is a character who has broken far, far out of her original setting in the crime and shadow riddled fiefs – where she learned to keep her head down and became one of the criminals. At first, she seemed as if she was just plain grateful to have become a very young and very immature Hawk, one of the law enforcers of this world. But her circumstances keep forcing her to become more, and her internal voice is the scared, uncertain yet determined voice of anyone who has ever come so far and so fast from where they began that they are just certain that it all not merely can be taken away, but should.And she tries anyway.One final note, one of the interesting themes in this particular entry is about the power, and the responsibility of choice, and just how different that perspective of choice is depending on where the chooser stands on any scale of wealthy, poverty, power and responsibility. Kaylin knows that in her early life, even her terrible decisions were her choice. Her alternative choice to committing the crimes of her early years was death, but it was still her choice. The Adversary of this story is not, strictly speaking, evil. Instead, it offers choices to people who choose to take a path that seems evil in pursuit of power. But the choice, and the offering of that choice, is not evil in and of itself – only the result.I’m still thinking about that, and probably will be when the untitled 15th book in this series comes out, hopefully this time next year. And not nearly soon enough. 😻I live this series. But I will admit it makes me feel stupid. The play on words is just a way but out of my minds reach. Some of it I enjoy though. The emotional ups and downs and the action. It’s just when they get into her powers with words. It really does make me confused. Kinda wished she could dumb it down. This is the last part of the arc that started with Kaylin’s trip to the West March, but less obviously this is the end of the arc that started with her first step into the high halls. I enjoyed the book because we finally see sort of an end to problems for other characters which had disturbed Kaylin. There was a bit more character growth in Kaylin and somewhat less childish and/or tedious inner monologues. However, there were still several times where i yelled out loud for the story to move on already, but the end of the book made me forgive them.The story was about 40% Dinner w/important guest, 10% moving to next parts of story, 40% main event, 8% resolution of main event, a I enjoyed the book because we finally see sort of an end to problems for other characters which had disturbed Kaylin. There was a bit more character growth in Kaylin and somewhat less childish and/or tedious inner monologues. However, there were still several times where i yelled out loud for the story to move on already, but the end of the book made me forgive them.The story was about 40% Dinner w/important guest, 10% moving to next parts of story, 40% main event, 8% resolution of main event, and 2% tie-in for next book. The tie-in part of the ending made me annoyed that I don’t have the next book available. So much of this book felt slow, conversations about the nature of naming and magic and politics. So much of it felt dry and theoretical and pointless... but it built to an ending that made me cry. That made meticulous sense and touched my heart.